The tireless efforts of the staff of the Douglas E. Goldman Jewish Genealogy Center to gather information on Jewish families has not only created an astounding database of almost three million individuals, but has also had the vital outcome of gathering valuable information on Holocaust victims. The new state-of-art computer system has enabled improved searches of the museum’s databases, including the genealogy database. These latest developments have enabled much better access to the information concerning Holocaust victims and the ability to generate comprehensive lists with the names of all Holocaust victims recorded in the genealogy database of Beit Hatfutsot. It is of the utmost importance that the names of all Holocaust victims be recorded with the Central Database of Shoah Victims’ Names at Yad Vashem, the Holocaust’s Martyrs and Heroes’ Remembrance Authority in Jerusalem. The Genealogy Center at Beit Hatfutsot is collaborating with Yad Vashem to ensure that all available information on Holocaust victims is properly recorded in the Central Database of Shoah Victim’s Names, in particular for the Hall of Names. The Genealogy Center is providing Yad Vashem with lists of Holocaust victims based on the genealogical information recorded with Beit Hatfutsot by Jewish families from all over the world. – Is this person possibly related to me? – If so, when could our common ancestor have lived? – What is his or her ancestral background? With the growth of the database, people that tested started also finding matches with close relationships in the database: long lost relatives, adoptees finding information about their paternal and maternal lines, and even Holocaust survivors that grew as non-Jews, were able to find their Jewish ancestry! This service has been now available for over ten years, tested more than 300,000 people, and its database has now a critical mass of Jews and non-Jews. Genetic Genealogy is of particular importance for the Jewish people as throughout centuries Jewish populations have dispersed, forced into other religions and decimated by the Inquisition, pogroms and the Holocaust. By analyzing one’s DNA we can now find long lost relationships, have hints of ancestral origins, or tell if someone who is not Jewish could possibly descent from an Inquisition convert. It can verify a possible adoption that could have happened generations ago, as well as determine if the two families with the same or similar surname are related. DNA tests provide new solutions to old genealogical challenges. More recently Family Tree DNA developed the Family Finder Test – which will allow connecting with family members across all ancestral lines. This test has a special significance for people trying to connect with long lost family members. This is a very relevant test for people of Jewish ancestry and who are looking for family members that may have survived the Holocaust. Of course, the matches are across people that have performed this specific test, and therefore, the largest this database grows, the higher the likelihood of finding relevant matches. In addition to the Family Finder, there is also the Y-DNA test, which matches men with a specific paternal line and the mtDNA which finds potential relatives only along the maternal line. Family Finder can look for close relationships along all ancestral lines. Anyone, regardless of their gender, may confidently match to male and female cousins from any of their family lines in the past five generations. The science – linked blocks of DNA across the 22 autosomal chromosomes are matched between two people. Based on this concept, Family Tree DNA bioinformatics team has worked extensively to develop the calculations that would yield the closeness of the relationship. The possibilities to find matches abound: grandparents, aunts and uncles; half siblings; first, second, third and fourth cousins; and, more tentatively, fifth cousins. “Family Finder” focuses on the genealogy of the test takers: matching contact names and email addresses are readily available for easy communication, and special tools have been developed to assist in the genealogy and matching process. The new frontier of Genetic Genealogy provides a very powerful tool to be used in conjunction with your family history research. Testing is affordable, can provide information that is not available from other sources, and is often helpful in solving brick walls. Family Tree DNA, the largest Genetic Genealogy company in the world, with whom Beit Hatfutsot is now working in partnership, offers several different tests. You can take one or more, depending on your genealogical DNA testing goals. A unique, innovative project is underway at the University of Arizona, aiming to reunite families torn apart by the Holocaust. The DNA Shoah Project is a non-profit, humanitarian effort, working to build a global genetic database of Holocaust survivors, their children and grandchildren in an attempt to match displaced relatives, provide Shoah orphans with information about their biological families and eventually, when the database has reached sufficient size, assist European governments with the identification of Holocaust-era remains that continue to surface. The project is the brainchild of entrepreneur and philanthropist, Syd Mandelbaum, a scientist by trade and the child of Holocaust survivors. Upon reading an on-line news story in November of 2005 about the discovery of World War II-era remains outside Stuttgart, Germany, he quickly learned that no database existed to aid in remains repatriation or to alert families to their discovery. After further inquiry, he was introduced to Dr. Michael Hammer, a renowned geneticist at the University of Arizona with a background in Jewish population genetics and the director of the Genomic Analysis and Technology Core (GATC) facility. The two men’s meeting was fortuitous, as Dr. Hammer’s lab is uniquely positioned to perform the task that they envisioned. Mandelbaum and Hammer rounded out the technological side of their endeavor with the participation and contributions of Howard Cash, President and CEO of Gene Code Forensics, Inc. Mr. Cash designed and developed the forensic matching software, M-FISyS (pronounced “Emphasis”), used to identify victims of the World Trade Center attacks. He also sits on the Michigan State Commission on Genetics, Privacy and Progress, whose recommendations regarding genetic information and privacy have all been signed into Michigan state law. The founders’ goals are ambitious: where typical forensic reconstructions involve recent events and a limited geographical scope, this project seeks to reunite family members over decades and continents. In order to have any chance of success, the project cofounders need access to the very best of contemporary genomic technologies and tens of thousands of people, perhaps more, will need to contribute their DNA to the database. 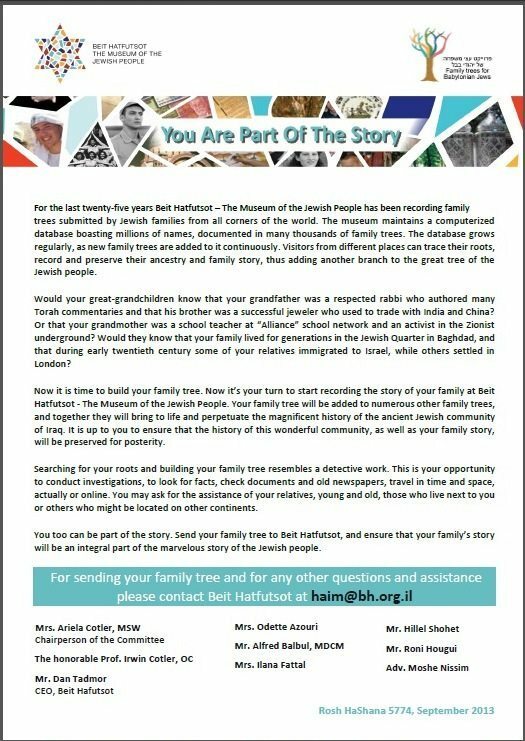 To reach this target, representatives from the DNA Shoah Project are traveling extensively, speaking to survivor groups and Jewish genealogists, offering presentations for audiences at Jewish Community Centers, Hadassah meetings, synagogues and civic groups, advertising in Jewish media and encouraging all participants to spread word of the project. A critical part of the project’s outreach strategy is the “deputizing” of remote administrators who will be trained to speak on the project’s behalf and conduct group collections, both in North America and abroad. The project has also partnered with the Holocaust and War Victims’ Tracing Service of the American Red Cross in order reach a broader audience. From the very beginning of this effort, the project’s founders have insisted that their services remain free of charge to the survivor community. To date, operational expenses have been covered by private donations and from in-kind contributions by Arizona Research Laboratories at the University of Arizona. If the project is to achieve its operational goals, however, support from the greater community, the Jewish community in particular, is required. The collection of a genetic sample involves a simple, painless cheek swab that can be self-administered. A “kit” with the necessary equipment and forms will be sent out to anyone who requests one, anywhere in the world, free of charge. The paperwork, including biographical and contact information, a family tree, and missing persons forms, can also be accessed via the project’s web site, at www.dnashoah.org. Participants’ information is held in the strictest confidence. The DNA Shoah Project will not conduct any research on genetic samples nor will contributors’ information will be shared with any outside entity or organization. In addition to the creation of the genetic database, the project has two other mandates: one is the creation of an online memorial, where the families of victims and survivors can upload their testimonies, photos and images of artifacts that illustrate their family’s story. This aspect of the project is unique in that it is user-driven and will create a museum whose content will be determined entirely by its participants. The second is the development of science-based curricula aimed at high-school students and adult learners. These modules capitalize on pop culture enthusiasm for modern forensic technologies and will supplement existing Holocaust education materials that are already widely available in the disciplines of history, social sciences and the arts. Mr. Mandelbaum stresses that this is a project for the living, one that aims to uncover familial relationships among siblings or cousins who may not even be aware of each other’s existence. But it would be irresponsible to not construct the best database that current science and technology allow, a database that could one day prove useful if European governments decide to fully investigate World War II-era mass graves. Three of Mr. Mandelbaum’s grandparents were cremated at Auschwitz in 1942, and his mother’s father toiled in a slave labor camp for an additional year and his whereabouts are unknown. It is in just such a circumstance that this project could provide answers, and closure, to families.